Credit from http://ascendinghearts.net/2010/12/twin-flames-1/ Please see, great write up! June 2nd (depending on where you are) will be the new moon partial eclipse event that activates and refreshes the Gemini part of our charts. Gemini rules communications, thought processes, and short-trips. Gemini rules our siblings and the duality of the mind, ever-fluctuating between the positive and negative poles. Gemini is the sign that rules the activities of the mind, categorizes things, and distinguishes them into patterns. Gemini represents how we filter information from our environment, and could be described as a mental “net.” It’s our subjective lens for viewing our neighborhood and our neighbors, and shows even how we obtain our information about the world. Gemini is the also the mouthpiece of the astrological chart, showing us how we speak our truth using either chosen symbols or that of our native tongue. Gemini is the sign of the twins; it represents the duality of the mind. It is also the 3rd astrological sign in the zodiac, and the 1st air sign. The 3rd aspect takes the form of a stage for the two dancing dualities to perform—this can be in the form of words, thoughts, writing, and picture symbols. 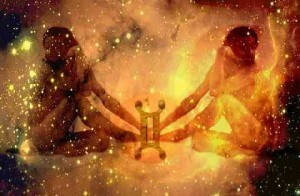 In its most primitive sense, Gemini is the first expression of relationship itself: the marriage of any two things and their interaction. Gemini energy can be likened to a web where the material itself is gossamer, delicate, but has strength in its complexity, and its design. Nevertheless, Gemini introduces levity to the collective consciousness. During Gemini ruled times, we may brush lightly about subjects, moving from one to another without the need to go to go very deeply in between or below the surface. It’s a good time for being analytical and detached, survey our resources, and collect information we need for our projects. This is a process that keeps the wind moving and the air flowing (the ideas light). When we see a new moon in Gemini, we are opening up another window into the psyche of how we identify and use information, especially in a local way or immediate way. This is a time where we may start talking more to those around us, or even less. It’s a time for stabilizing communications (Sun conjunct Moon forms a trine aspect to Saturn in Libra). For some, we will open up to learning a new language, or even start a new learning process. Perhaps we will chatter on more about what we see and do with those nearby; there could be changes in our relationships to siblings. The new moon’s trine aspect to Saturn can go mainly in two different ways: One is that this aspect can act as a stabilizer for whatever mental activity or communication takes place, giving whatever is to come has a long-lasting and dedicated affect. The other slightly different way is that Saturn can filter the Gemini creation into a specific and dedicated structure or format. In this new moon chart, Saturn is forming a harmonious aspect to the new moon, making for the most positive expression of this new moon. The tendency is that this aspect will be smooth and easy, and operate with natural guidance or stability. Since Saturn is still retrograde till the middle of June, our commitments are focused inwardly. Usually in astrology eclipses are considered more powerful than a regular New Moon event, and have a longer-lasting and deeper affect. In the old days, eclipses were considered to be omens and portents about the future, especially for leaders. Now-a-days, many astrologers have a view that the external movements of the heavens, or the planets as they appear to look here on Earth, not only represent natural cycles, but that planetary events viewed on Earth represent changes within our own psyches, mirroring our individual and collective consciousness. Since the new moon is a monthly, regular gift of opening up to something “new” and planting seeds for a new venture, you can do this at this New Moon Solar Eclipse in Gemini, and it’s an especially powerful time to plant your intentions for the future—it’s a good time for technology purchases, car purchases, committing to write a book, or starting your education in a new subject. It’s also a good time to revisit relationships with your siblings if you’ve been waiting for one. A Solar Eclipse, however, does add a certain unexpected quality, or miscellaneous ingredient into your mix: so as you set your intentions, be aware that there is a heavenly variable at work in your personal destiny. Now is the time that it’s just more obvious that heaven speaks on your behalf. Look back. Don’t go back. The moon shines at night, it is reflecting the conscious light of the sun; and Moon, she takes her shape from the positions of the Earth and Sun as they inform her own position. The moon, then, represents the unconscious, fertile, and form-making aspect of our lives. It is at Scorpio, then, that we begin to prune and tend to our gardens created by what we planted at the Taurus new moon. We start to see our intentions taking shape. Scorpio, the opposite sign of Taurus, is about shared resources, the earth’s resources, debts, obligations, and other people’s money. Financial questions are on the forefront at this time and so with them is our relationship to other people, material value, and to the earth herself as a resource. Scorpio is the sign of the scorpion. She can sting with her tail. Her sting penetrates—which is the key function of the sign of Scorpio: penetration. Scorpio saturates and is saturated by everything that she is in relationship with. What she brings to the table is the up-surging of subterranean drives, and the emotional richness of connection and intimacy. She, also, expresses herself through transactions, of sexuality or money—even energy—from the deepest upwelling of underlying passion. She is out of control, or, always in control. She’s past the Libran balance of here *and* there simultaneously. Scorpio is all-in. That is why Scorpio charges the air with magnetic power. Swift and smart, deep and hidden, yet guileless when she goes for the jugular, that is Scorpio. If she is in her most pristine form, she will cleanse you of everything-transform your destructive nature into absolute creative power, for she provides the emotional richness of connection, deep, reverent union. Instinctual and animalistic is her power, once released, it is explosive. Form (Taurus) is Re-formed (Scorpio). With this full moon, we have a T-square aspect (two, 90 degree angles) with the planet Neptune. That is, the Sun is opposite the Moon, and both bodies are squaring Neptune in Pisces. Here we must use our energy and soul essence (Sun) for spiritual purposes (Neptune), surrendering all our conscious drive for wholeness *and* our unconscious, emotional body for transcendence. Both male and female must re-configure. We must give away or purge (Scorpio) our illusions (Neptune) about spirituality. Surrender (Neptune) our constructions and any ‘it must be this way’ thought-forms (Saturn) to intimately deepen with the power (Scorpio) of the unformed—that which springs up from unlimited origins (Neptune). Do not let issues from the past bubble up and tell you how the future will be. 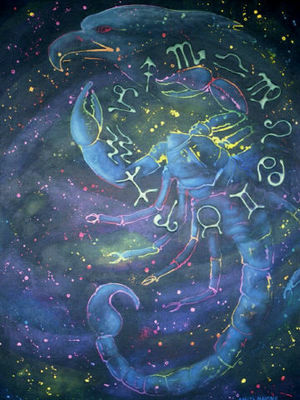 The past is only one channel that leads into the future, giving ourselves the power of interpretation and using psychological mastery (Scorpio), we can re-frame the past into one which allows for the future of your choice. Know that the source that makes the future is far more limitless and undetermined than our minds would like us to think with our thoughts about what the past was. With the Moon and Sun squaring Neptune there is a tendency to get confused. Be forewarned but do not forlorn because you are aware of this transit, you have come to the crossroads of another decision to cut through (Scorpio) the illusion, confusion, deception, and penetrate the fog of confusion (Neptune). Renew your commitment to cutting out the dross within your own psyche, forge a new path with your will-to-faith that confusion and limitation is temporary *and* transformative. You have forged a new path for yourself when you surrender to the process of your own spirit, emerging out of old form into new form. Currently, I am on a spiritual journey on the beautiful island of Kauai, Hawaii. I’ve visited Buddhist and Hindu temples, and paid tribute to the ancestors at ancient Hawaiian heiaus (temples), experiencing my own re-birth, in many ways. At moments, the movements of my spirit were even invisible to me. This is a time of great portent, and deep release. Please see this website for New Moon information. I will be in ceremony on Anini Beach on May 2th.